The SolarWall system at Fort Smith in the Northwest Territories, Canada, was combined with a Heat Recovery Ventilator (HRV). The systems were monitored and proved to be extremely effective in combination with each other. With the two systems in place, virtually no additional heating of the ventilation air is required during the day. 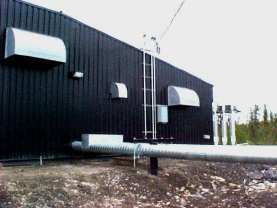 Over the course of each year, the two systems are offsetting approximately 4000 litres of oil. Due to the success of this initial job in “Canada’s Arctic”, many other SolarWall systems, including the Iqualuit Airport, Western Arctic Research Station, Aboriginal & Northern Affairs Canada’s Geoscience Building in Yellowknife, the Youth Offenders Correctional Facility in Inuvik, Alaittus School in Rankin Inlet, Weledeh Catholic School in Yellowknife, and several others were installed. Continuous ventilation air is required to maintain a high standard of indoor air quality in recreation centers, such as the new one that was constructed in Fort Smith. Featuring a fitness room, gymnasium, curling rink, and squash courts, the facility was going to be in operation 7 days a week & 14 hours a day. This meant that indoor ventilation heating would represent the largest single use of energy in the building.Solar air heating is particularity attractive in northern and remote communities given the long heating season, solar availability and the high cost of transporting fossil fuels.